In these Terms and Conditions ‘we’ and ‘us’ mean the Victoria Police Blue Ribbon Foundation Inc (VPBRF) ABN: 40 715 029 918 of 2 Central Ave (P.O. Box 2012) Moorabbin, Victoria and ‘you’ means you the customer. These Terms and Conditions together with your Order constitute the entire Contract between us and you for the supply of Products. The Contract cannot be varied unless we agree to vary it in writing or by email. 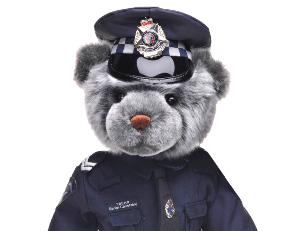 If you are under the age eighteen (18) years you cannot place orders with Victoria Police Blue Ribbon Foundation Inc. By accepting these Terms and Conditions you acknowledge that you are over the age of eighteen (18) years. You may place an Order by filling in the Order Form on the VPBRF Site and clicking the “Submit My Order” button. By placing an Order, you make an offer to us to purchase the Products you have selected based on these Terms and Conditions. Information contained on the VPBRF website constitutes an invitation to treat. No information on our website constitutes or should be deemed as an offer by us to supply any Products; however VPBRF will make every effort to supply Products to you. We do not formally accept your offer until your order has passed our internal validation procedures for verifying the bona fides of each order placed, for the purpose of preventing credit card or payment fraud. VPBRF and its affiliates reserve the right to refuse service, terminate accounts, remove or edit content, or cancel orders in their sole discretion. If we cannot process or accept your Order after payment is received we will contact you by email or telephone. VPBRF currently accepts PayPal, Visa, MasterCard and American Express only. Business days are Monday through Friday, excluding Victorian Public holidays. We process credit card and PayPal payments after you click the ‘Submit My Order’ button. Where you pay by BPAY you must pay the price payable in Australian dollars. If a BPAY payment is not received within 7 days from the date that you submit your order, VPBRF reserves the right to cancel the transaction. For credit card and PayPal payments we will supply a tax invoice to you with your Order. Your tax invoice is your proof of purchase. VPBRF reserves the right to change prices for Products displayed on this site at any time. Orders submitted and accepted by VPBRF will be billed at the price(s) shown on the site at time of order. Shipping cost is shown separately on the product page but may be recalculated based on how many and what items you place in your shopping cart. Subject to these Terms and Conditions, we will supply to you the Products indicated on your Order. If Products are out of stock when we receive your Order we will contact you to arrange for a backorder to be created or to refund the cost of Products not available. Delivery time takes up to 10 working days from the date your payment is received. Please note that the overall time period may increase by 1-2 days for Bpay payments. VPBRF makes every effort to deliver your Product according to the estimated delivery times. The estimated delivery times are in business days (Monday through Friday) excluding Public holidays. Unless otherwise agreed by us, we will deliver your Products to the address indicated on your Order. If no-one is available to take delivery of your Products, our carrier (Australia Post) will leave a card so you can pick-up your Product from your local Post Office. Where delivery is by our courier service and no-one is available to take delivery, they will leave a card requesting you to telephone them to arrange a suitable time and date for delivery. We will use our reasonable efforts to deliver your Products to you within the estimated delivery time indicated on your Order; however, we do not guarantee that we will deliver within this time frame. Title and risk of loss to all Products will pass to you on deliver. Please Note: In the case of Special or Limited Offers delivery time of Products may vary to what is stated above. In such cases delivery time and method shall be stated as part of the Special or Limited Offer. For further assistance with product returns, please contact us by phoning 03 9555 8000. Unless otherwise stated all Products sold by VPBRF are supplied with a 90-day replacement warranty. Statutory conditions and warranties apply. Nothing in these Terms and Conditions excludes the application of those statutory conditions and warranties. VPBRF is a Deductible Gift Recipient registered with the Australian Tax Office and Donations of $2 or more are tax deductible. A Donation will be deemed to have been made when you press the Submit button. A tax receipt will be issued by VPBRF for all Donations by post or email. Donations are non-refundable. The booking and your attendance at the Event shall be deemed as confirmed when you press Submit Order. Your cancellation or alteration to your booking or attendance can only be accepted up to a maximum of 10-Days prior to the staging of the Event. If your booking and attendance is cancelled less than 10-Days prior to the Event VPBRF will not be obligated to refund your Purchase. No refund shall be available if you are unable to attend the Event due to sickness or other circumstance that is outside of the control of VPBRF. By placing your Order, you agree that we may store, process and use data collected from your Order Form for the purposes of processing your Order. You also agree that we may use such data, other than credit card details, in order to provide you with information from time to time on other VPBRF Products, Services & Events that may be of interest to you. If you do not agree to our using such data in order to provide you with information on other VPBRF Products, you should indicate your non-agreement on the appropriate section of your Order Form. You may obtain a copy of the data held by us concerning you on request in writing. We reserve the right to charge an administration fee for processing such request. If any data held by us concerning you is incorrect, we will correct it on your written request. The data collected and stored by us will not be re-distributed, sold or made available to any outside agencies or third parties unless where required by Law. Whilst VPBRF employs the current credit card processing technology software for its transactions with our customers, VPBRF will not be responsible for any damages, consequential losses (whether direct or indirect) suffered by a customer whose credit card is fraudulently used or is used in an unauthorised manner. VPBRF shall not be liable for any delay in performing any of its obligations under these Terms and Conditions if such delay is caused by circumstances beyond the reasonable control of VPBRF, and VPBRF shall be entitled to a reasonable extension of time for the performance of such obligations.